Irvington landmark commonly known as The White House. Two photos above are two historic apartment buildings that emulate large single-family homes in the Irvington neighborhood. 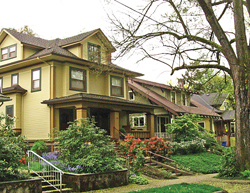 On November 5, 2010 northeast Portland’s Irvington neighborhood was officially listed as an Historic District on the National Register of Historic Places. It joins Ladd’s Addition, King’s Hill, Lair Hill, and the Alphabet District (northwest) as the only other Portland neighborhoods to achieve this official designation. The new district’s boundaries include (roughly) NE Broadway on the south, NE 7th to the west, NE Fremont on the north, NE 27th (and 28th) to the east. Homebuilding started in Irvington in 1891. The new electric streetcar over the bridge enabled people who worked downtown to easily flee the city to the peace and quiet of their suburban homes. Early Irvington residents could also find employment in the bustling nearby neighborhood of Albina. Irvington was platted on the “gridiron” system (i.e., streets were laid out in rectangular blocks oriented to the points of the compass). This form of development was similar to many other “streetcar suburbs” being built in American cities at the time. Comfortable but relatively modest middle-class houses were initially built (mostly) in the western end of the district closest to town. Construction lagged for a time after the Panic of 1893 caused a steep decrease in homebuilding everywhere. It wasn’t until more prosperous times toward the end of the decade that new Irvington homes were built again with any regularity. Irvington also got a significant boost in 1899 when the streetcar was extended down Broadway to 24th. Other streetcar lines would soon follow. By the end of the first decade of the twentieth century, Irvington was served by streetcar lines down Broadway, 15th, 21st, and 24th. As Irvington became more accessible it became more desirable. Soon, much larger homes designed by prominent architects were popping up among the more modest existing houses, especially east of 15th. The largest growth spurt of Irvington came after Portland’s Lewis and Clark Exhibition of 1905. By then, Irvington’s reputation as a desirable residential enclave was locked in place. The neighborhood rode the tide of prosperity sweeping the entire metropolitan area and continued to be oriented (mostly) to more affluent homebuyers. A number of apartments were built in this time period, too, to accommodate people with more modest incomes or smaller families. These apartments were among the finest apartments being built in the city at the time. Many were built to resemble the fashionable single-family homes of the neighborhood. Development and prosperity followed Irvington through the 1920s. The 1930s Depression years proved difficult for many Irvington residents, but overall, the neighborhood survived intact, albeit with some more modest houses built as infill through the 1930s and into the post-war decades. The 1960s and 1970s saw deterioration in some of the housing stock, and the neighborhood lost many blocks of historic houses when its “Broadway end” was re-zoned to allow new multi-unit apartments. But the past several decades have seen a surge of interest in preserving and restoring the historic fabric of this vital and beautiful historic neighborhood. The Irvington Community Association is now one of the most active neighborhood groups in the city. The listing of Irvington on the National Register is largely due to their tireless efforts. Today, Irvington remains a treasure chest of historic houses and buildings located on magnificent tree-lined streets. Many eras of historic house styles can be found here, from Victorian Queen Anne to Mid-Century Modern. The largest number of house styles, though, reflects the largest growth spurts in the district. Craftsman, Bungalow, Four-Square, and Prairie houses were built during the boom years following the Lewis and Clark Exhibition of 1905. Tudor, English Cottage, and Mediterranean Revival houses were all popular in the significant but more restrained 1920s growth period. Victorians in the neighborhood are few but significant. Many Colonial Revival houses exist, though they were constructed in all eras. Twenty-eight houses were already on the National Register at the time the whole neighborhood was listed. Four of these are detailed further in this article. Each spring, the Irvington Neighborhood Association puts on a tour of some of the most interesting homes in the district. Visit www.irvingtonhometour.com for more information. There are 28 Irvington houses individually listed on the National Register. The four houses below were built by very recognizable Portland families. This listing on the National Register of Historic Places recognizes both the building’s architectural merit and its long association with the Doernbecher family. The house’s first owner, Frank Silas Doernbecher, was the founder of the Doernbecher Furniture Company, one of the nation’s largest furniture manufacturers of its time. Upon his death his heirs established the Doernbecher Children’s Hospital from a bequest in his estate. The Doernbecher family continued to occupy the house for three generations. The building’s Tudor-style features reflect the design and philosophy of the English Arts & Crafts movement. The house’s architect, Joseph Jacobberger, would go on to design a number of other fine homes in Irvington and elsewhere. The 1891 Povey House is one of the first homes built in Irvington and one of the neighborhood’s few Victorian structures. Although neighborhood home development began in 1891, the Panic of 1893 started a building slowdown that lasted much of the decade. After 1900 very few of Irvington’s houses were built with design features we associate with Victorian homes. The Povey House presents an outstanding intact example of a comfortable middle-class Victorian Queen Anne-style residence. The Povey house is also notable for its association with John Povey of the Povey Brothers Art and Stained Glass Works. Povey stained glass today is a highly regarded feature found in some of Portland’s finest older homes and churches. The Povey house was designed and built by Peter Hobkirk. The first occupant of the house was David Oliphant. But the house is better known today as the long-term residence of Governor George Chamberlain. The two-term governor — and then two-term senator — owned the house from 1904 until 1928. The house became a school through the Depression years and various succeeding ownerships dimmed much of its original luster. New owners in 1991 recognized the building’s historic and architectural merit and began a six-year-long restoration that included placing the building on the National Register. Designed by the well respected architectural firm of Whidden and Lewis, the home is one of the first East Coast Shingle-style houses in Portland. These houses provided an alternative to the more fussy Queen Anne style of the day. This home is considered one of the comparatively few remaining True Craftsman-style houses in the country, and the only one in Portland. A True Craftsman-style house must be constructed from plans originally published in Gustav Stickley’s magazine The Craftsman. 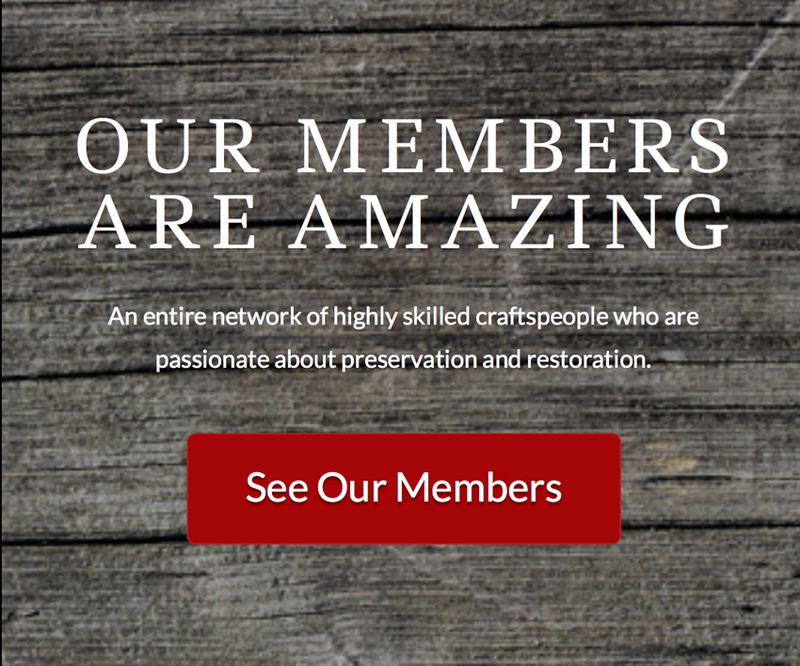 The far more numerous and generic Craftsman-style houses are those merely built on Stickley’s ideals. Lewis T. Gilliland commissioned noted Portland architect Ellis Lawrence to slightly customize the magazine’s interior plan and to supervise construction of the house. The plans were originally published in the April 1907 issue of The Craftsman magazine and again in a compendium publication in 1908. Ellis Lawrence designed a number of other homes in Portland for prominent clients. He also is given credit for establishing the first School of Architecture at the University of Oregon. Jack Bookwalter is a freelance writer and architectural historian living in Portland, OR. Photographs by Jack Bookwalter.